I've tried to define some of the characteristics that make up 'blog culture', including the ethos of a gift economy, where people are rewarded by recognition and 'in-kind' returns rather than cash, and the focus on the "individual, authentic voice". I've also been one of many to be wary of attempts to undermine this authenticity by marketers. Now — prompted by an example of pretty crass behaviour by a blogger distributing bootleg recordings — I'm beginning to wonder if my belief in that authenticity may have been a little naive in the first place — a bit like the old white bicycles schemes that started with great intentions only to be undermined by the unscrupulous. We all know that some artists and bands give explicit or tacit support to fans trading live recordings for profit. I guess the publishers may not always be happy about this, but that never seemed to stop the Grateful Dead. So far, no problem. But some artists make it clear that they object to this, and ask audiences explicitly to refrain from recording live shows. So here is a blogger that has posted a recording of Robert Fripp and the League of Crafty Guitarists, with photograph, including a recording of the "statement of policy regarding no photos and no recordings". The "spread the love" text above is taken from this same blog site. Mr. Blogger seeks to present himself as a provider of music, a supporter of music & of particular musicians, unconstrained & unmotivated by commerce. This is a lie. He does not have the authority to give away our work. He attracts attention to himself, not for & from his own work & efforts, but by taking & using the work of others, not only without consent but with knowledge of their disapproval. Mr. Blogger is using our work as currency in a scheme of trading & attention-gaining, commerce of a different guise. He demonstrates an example of dishonesty dressed up in fine clothes, and presents himself for public commendation. Here's a quick update for the next 7 days. Leaving aside the widely reported fact that this gig isn't taking place today, but has been postponed for two weeks, what do you think my chances would be of snapping up a ticket, based on this recommendation, a few hours before it started? And how do you think this makes me feel about other Bandsintown recommendations I receive? Trust is hard-won, but easily lost. 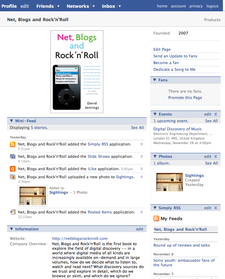 When Facebook announced the creation of Pages/Ads I thought this might provide a useful platform to promote my book, as complement to this blog for people who want a lightweight alternative to subscribing to my RSS feeds and suchlike. Maybe it's just a case of teething problems, maybe it's my unwillingness to RTFM, but I'm pretty disappointed with the experience so far. I've had a couple of nice reviews this month. 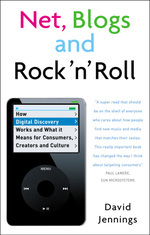 Writing in the Wired music blog, Eliot Van Buskirk said I was "spot on when discussing how people discover music today" and that the book "is rife with amusing metaphors and nuggets… a comprehensive and enjoyable read." Also in the November edition of Brand Strategy, Macky Drese concluded an in-depth review by saying the book "is invaluable to anyone interested in the science of digital discovery and particularly so for anyone needing to harness that for any business application." (Unfortunately the latter review is only available in full to subscribers, but let me know if you want more details.) I haven't seen anyone really lay into me yet — perhaps I wasn't sufficiently controversial — but let me know if you have! Here are all the reviews I know of. A text transcript of the MusicTank "Too Much Choice" discussion is now available to MusicTank members. (My reference to Fairtrade has been transcribed as one to the fur trade!) I understand the podcast of the event will appear here imminently (though, again, members only). Last week's talk in Vienna was a lot of fun, and even survived the PC losing power and shutting down on me three-quarters of the way through (prompting one of Feargal Sharkey's several interventions during the day: "How's your tap-dancing, David?"). You can see my slides, including the ones I was unable to show. My abstract is already online via the project site. When audio (and possibly video) is added I'll update this with a direct link to it. The conference publicity was very well organised, and if you can read German, here are an interview with me (very good questions), a brief mention in Spiegel Online, and a blog account. Next week I'm talking at the Centre for Digital Music, Queen Mary, University of London — details on Facebook, Upcoming. The third in my series of future scenarios from the first draft of my book imagines a situation where pocket music players with better-than-Zune sharing features have become so cheap as to be almost disposable (like cameras). It is also partly inspired by the story three years ago of Universal encouraging schoolchildren to act as ambassadors for bands like Busted and McFly. Universal suspended the initiative when it was exposed, but the principle will doubtless continue to be applied — and is being applied — as long as it is implemented more sensitively. I've been speaking to Ken Thompson at Swarmteams, and he talks about 'alpha fans' (comparable to the Savants and Originators in my book) building a reputation as trusted influencers with their network of contacts, and thus being able to act as ambassadors for bands (and brands?) — more on this in a week or two. This scenario plays out as a dialogue between mother and daughter, as the former is at first suspicious of the latter's hidden motives, but they are reconciled by the end. I know I'm no Raymond Carver, and so, with hindsight, it's no surprise that this story ended up on the cutting room floor, but the idea of the scenarios was to stimulate ideas about future possibilities, and I hope it serves this purpose. What kind of deals should creators be striking with publishers, record labels and other intermediaries in an environment where their work is increasingly distributed digitally? What does it really mean to be 'independent' or 'unsigned' in terms of the licences you agree for your work to be copied? I thought Andrew Dubber made a good distinction at the MusicTank debate here in London a couple of days ago, when he reacted strongly against the use of the term 'unsigned'. As he pointed out, if, as an artist or band, you sign up to the terms for having a profile page on MySpace, Bebo or Facebook, then you have literally 'signed' a licence agreement for the songs you upload there — and you can't strictly call yourself unsigned any more. 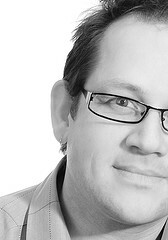 Instead Andrew suggest a distinction between the creators who license their work on a non-exclusive basis to multiple intermediaries — these he calls 'independent' — and those who sign over more exclusive rights in return for an upfront advance that they then have to earn back — these he calls 'indentured'. I think this is a useful way of thinking about the choices open to creators. In the next twelve days I'll be talking in Bratislava (with Gerd Leonhard and others), Vienna (with Peter Jenner, Feargal Sharkey and others) and London (with Baroness Susan Greenfield, Will Hutton and maybe even Kevin Spacey, though not in the same session as me!). See the events page for full details. See also the reviews page for recent reviews in The Guardian and Wired blogs.